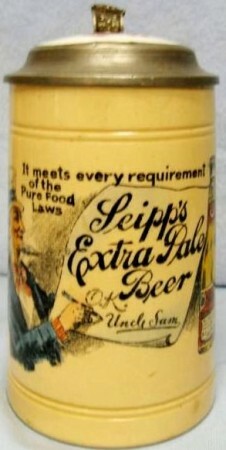 “Uncle Sam” steins – Self explanatory – see history notes below. “………….Who really knows where this glorified figure, in his colorful, patriotic clothes with his finger pointed accusingly forward, urging each of us to get involved in aiding our country through difficult times, really came from? Surely, no one does, because it is simply not known for sure (nor, it appears, will it ever, barring a miracle). There are, however, some very good guesses, at least one of which is probably correct. Exactly who came up with this has never been made clear, but nevertheless, it is said that from this point on, Uncle Sam (a man who did, in fact, bare a rather striking resemblance to that familiar image of the old, pointing gentleman, minus the fancy hat and patriotic flare) became a symbol of everyday Americans choosing to help their country in times of need. It is a wonderful story, whether or not it’s true. Actually, according to an official act of congress in 1961, it is the Samuel Wilson story which is the “official” explanation of the Uncle Sam legend. The issue wasn’t exactly put to rest, though. 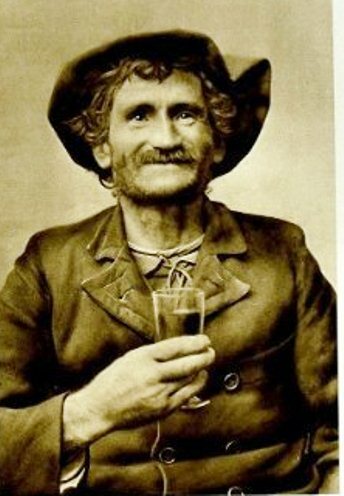 Alternately, and not without reason, there are some who believe that the Uncle Sam legend began with Irish Immigrants coming to the United States, who called the country SAM as an acronym for the Gaelic version of the name – Stait Aontaithe Mheiricea. It may be a bit more far-fetched than the story of Samuel Wilson, but who knows? It very well could turn out to be true. Then there is the third – the simplest, and some would say most reasonable of all, explanation. Perhaps Uncle Sam was just some jokester’s explanation of the common abbreviation U.S. After all, American’s come up with some crazy names for plenty of things, the odds are pretty good that at some point in the early parts of American history (the name was first seen in print in 1842), some wise guy saw the initials U.S. and came up with the name Uncle Sam right there off the top of his head, not realizing just what kind of legacy his little joke would have. Or perhaps there is even a fourth option – that being that none of the above is true. To be perfectly honest, it doesn’t appear that one can ever really know for sure. Americans just have to go on living their lives, not knowing where the image of their country’s most recognizable citizen came from. But this shouldn’t really change anything, should it? 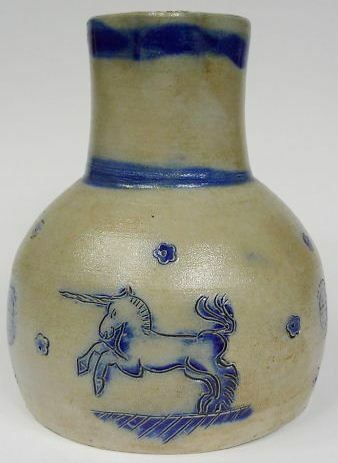 Unicorns [on steins] As with the ral animal Unicorns are hard to find on steins>They were nowhere as popular with young people as they are now. 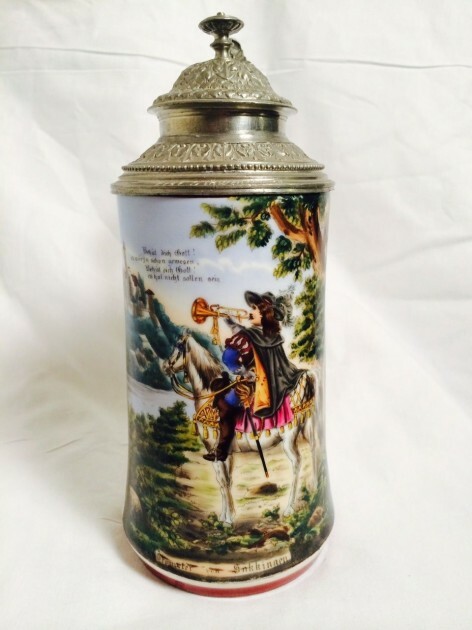 I am only guessing here, but the oldsters say only a “virgin” can capture a Unicorn and from the people I know who are steins collectors — ain’t any of them going increasing their collection with this one or one like it!! 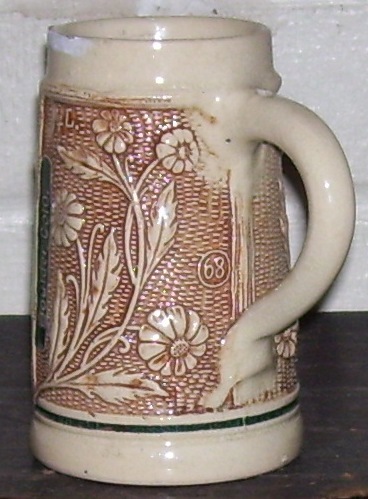 Shown ▲: A Westerwald incised main design with stamped rosettes, stoneware narrow neck jug, C a. 1850. Unique drinking vessels – By definition these types of drinking vessels have to be one of a kind. Of course it is always argumentative when one asks for more than one drinking vessel collector’s opinion on anything! Shown: Here’s one I think fits the definition of unique. I haven’t seen anything like it in 40 [+] years of collecting. 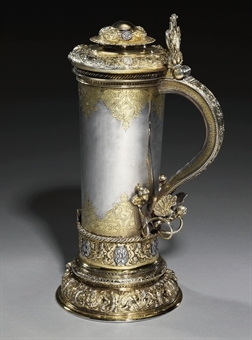 German silver Arts & Crafts cup made by artist Modell Wondra during the late 1800s; most likely 1885 to 1910. 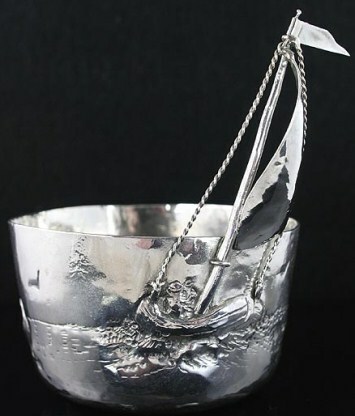 The sides of the cup are hand chased with a sailing scene, with gulls in the sky and rocks in the water. One side shows a sailboat and its skipper; the mast and sail are full bodied and rise up from the outside of the cup. The silver wires are beautifully designed to accurately replicate rope. The underside is marked Modell Wondra, 800 for the silver purity and it has the German crown & crescent moon symbols. The cup measures 3 1/8 inches in diameter and weighs 109 grams or 3.8 ounces. “The trumpeter of Sackingon ” – by Mr. Unknown. 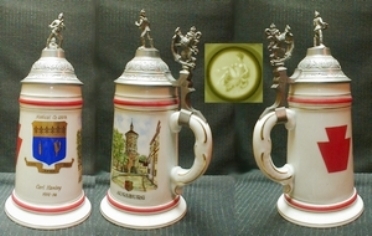 Unmarked steins – Every factory had a time making certain all there steins were marked. V & B Mettlach is notorious for not putting their Mercury mark on all their PUG steins. Some distributors, such as Paulson and TW, (Both Munich) didn’t want their wares signed by the real makers; they wanted the recognition and repeat orders. Once one gets acquainted with the major characteristics of the firms and learns the capacity marking system (developed for and discussed at the “Beer Stein College,” by David Harr) one will have a better chance of defining the maker of saltglazed stoneware. Upside down steins ▲. 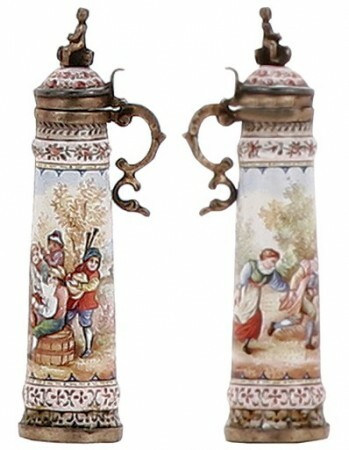 (Hanging steins is a misnomer) – Steins placed on a shelf so the fancy lids would be shown, and identified quickly by their owners. In the very old German taverns, the personally owned ‘mugs’ kept their for the locals, and some extras for travelers, were placed up-side down on a shelf. This kept the spiders, mice and other crawly things out of them. 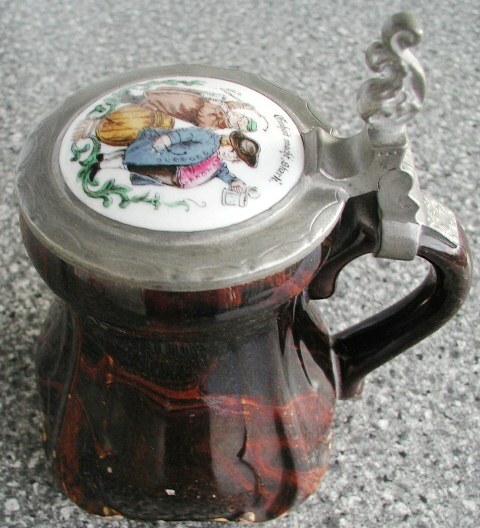 Later when mugs became steins, and the lids started to be decorated with heavy pewter relief names or scenes , or later with porcelain inserts; they were placed behind the bar area so their lids would hang down in a display position. 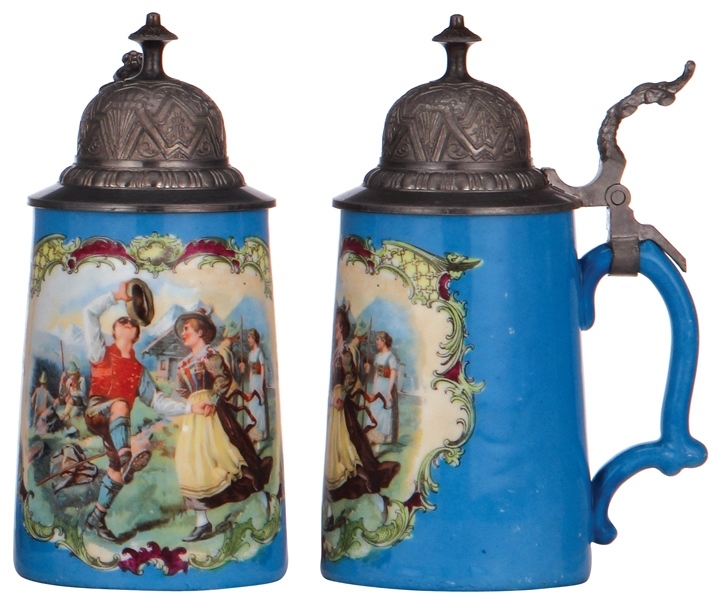 Those in the mid to late 1800’s would have been mostly beer steins with porcelain inserts or the fancy dedicated pewter lids, especially brewery steins like Hofbrau. The customer would then not have to transport his stein home with him and it was available next time he frequented the establishment. This custom still prevails at some large beer drinking establishments today, even here in the USA, however they have to keep them much higher now, due to constant theft! 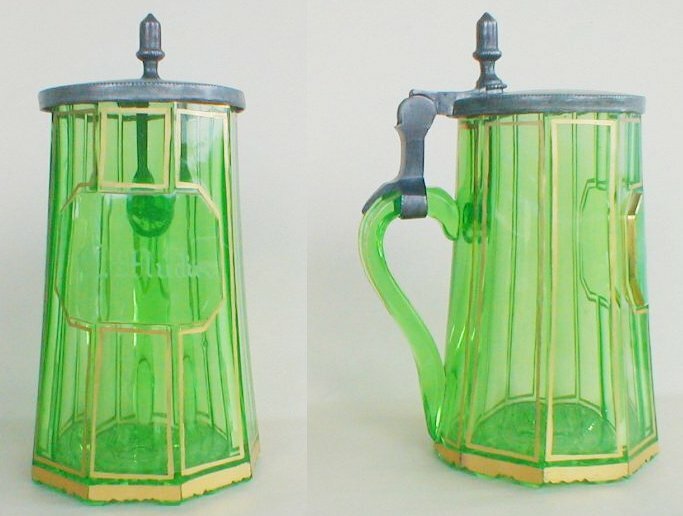 Uranium glass steins – Uranium added to the glass mixture to make a very distinctive coloration. 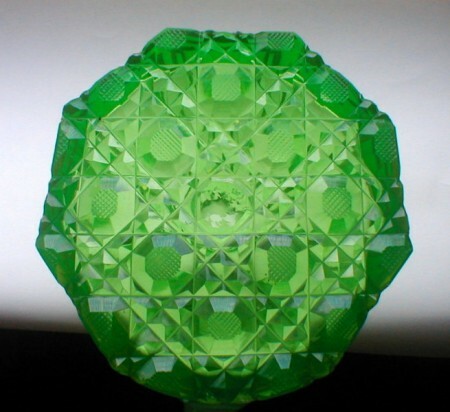 Shown Bohemian .5 liter uranium GLASS stein. Circa 1840. 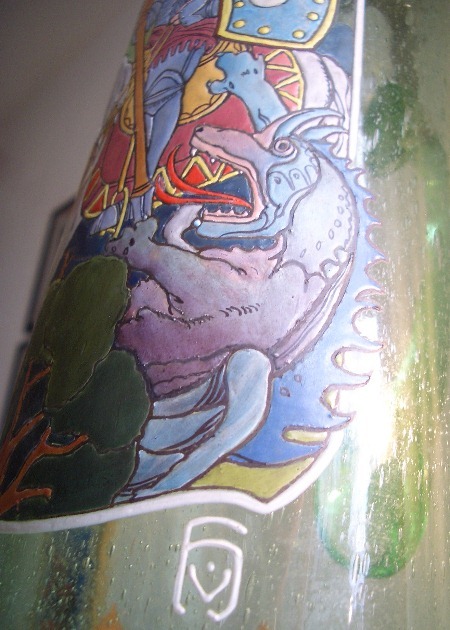 It will look brilliant under a “BLACK LIGHT” = See just below ▼for a glass “stirrup cup” shown in black light. 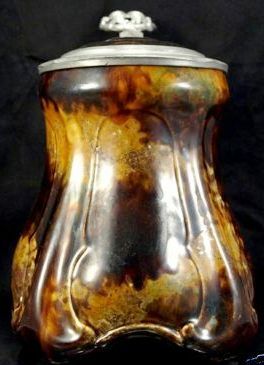 Urn thumblift – As shown above and below; most popular from about 1790 to 1840’s. 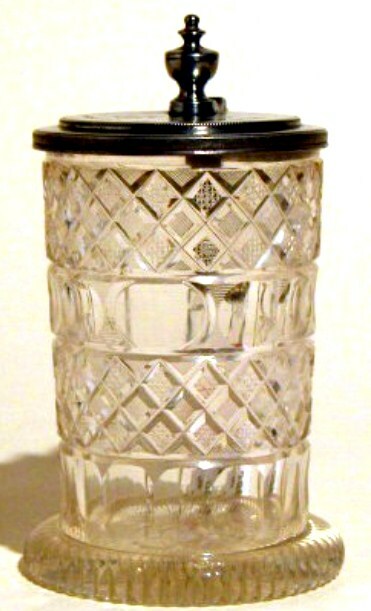 Smaller “Urn” pewter thumblift on a Bohemian cut glass stein. Ca. 1830. 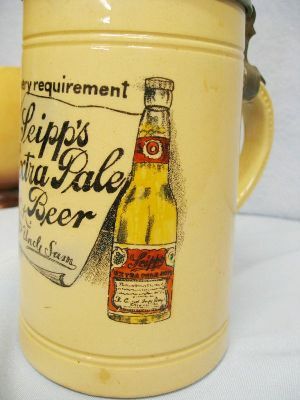 Utica Club Beer steins (Schultz and Dooley steins) – Shown ▲: Utica Club 40th Anniversary stein, 1959 – 1999. 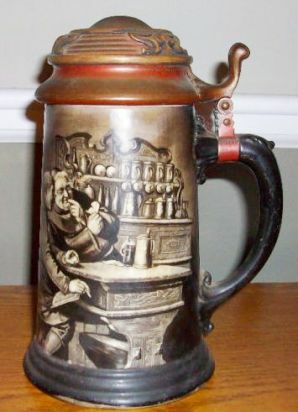 12″ high and has 20 different character steins from the FX Matt Brewing Co; the character steins Schultz and Dooley on top as finials. 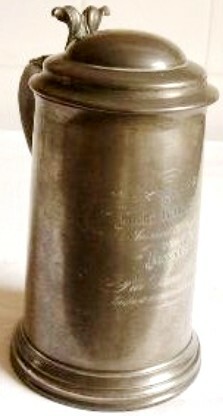 The numbered stein is marked on the bottom: “Numbered xxxx – WEBCO – Made in Germany Exclusively for FX Matt Brewing Co. Utica NY”. Shown ▲: The Valhalla Memorial in Germany. Valhalla – (Old Norse “Valhall”, i.e. “Hall of the Slain”) – The name given by the Scandinavians to the abode in which the god Odin received the souls of those who had fallen in battle. There they are represented as spending their time in constant fighting and feasting in his service. 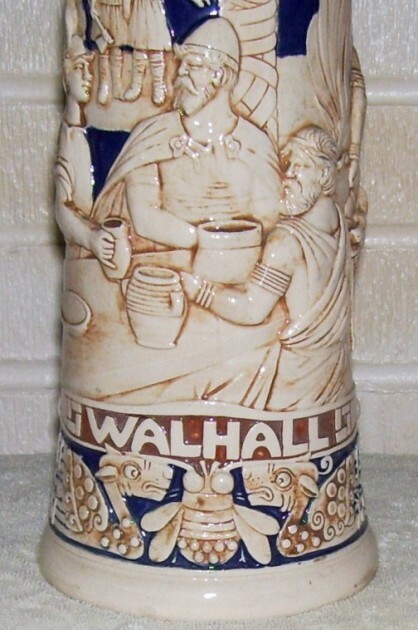 Written on German steins made for export to Scandinavia as “Walhall”. See also: “Walhalla” in this Compendium. V & B – see Villeroy and Boch below. 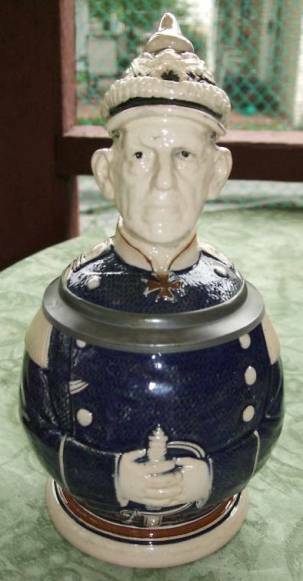 van Hauten – A well known decorator of enameled steins. His firm did lots of Student society steins. 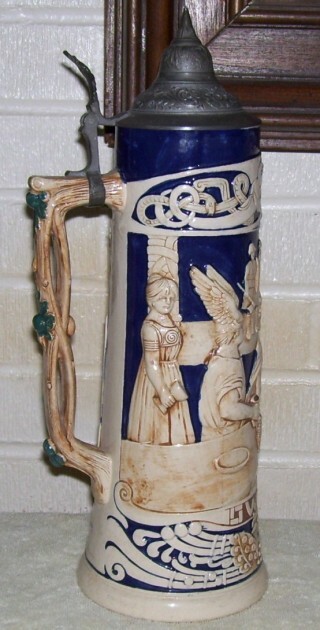 Shown: A 1/2 liter glass (Theresienthal’s) stein decorated with an enameled family’s Coat of Arms by van Hauten. 13 inch tall server probably by Poschinger [SP ?]. Enameled decoration of St. George by F. V. Hauten. Detail: Frederick von Hauten mark on the piece above ▲ = small v (with dot) / h.
Shown; A Marine Verein stein. Very unusual as it shows the Munich Maid on the shield and smaller shields show the colors for he Imperial Government (for the Navy) and  of the State of Bavaria. As there is no other info, and Bavaria had no Navy, I am thinking the ex-sailors in the Verein held a meeting there in Munich. Ca. 1900. A great place to get together again. 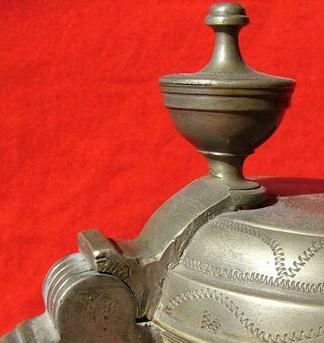 Verification Marks (Pewter) — Found on both British and French drinking vessels. 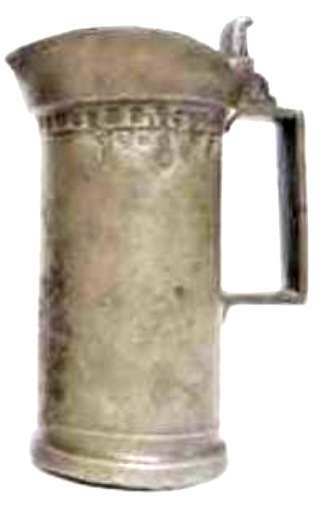 The stamped marks indicate the vessel(s) so stamped hold(s) the amount of liquid marked on the vessel; e.g., “pint.” Shown: The whole upper body is full of verification marks on this French tavern measure. Vermeil — Gold-plating process developed in France in the mid-1700s. France banned production of vermeil early in the 19th century because the process involved the use of mercury. 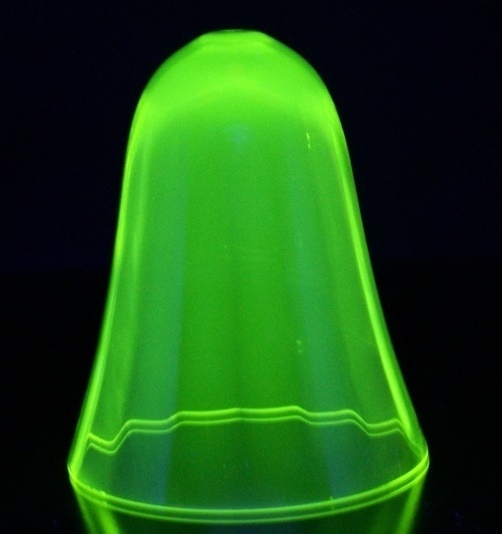 Present-day vermeil is produced by a safe electrolytic process. Vermeil is NOT gold wash. Vermeil is 18-24 carat gold layered over sterling silver. 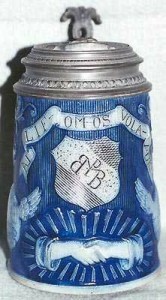 Victoria, Carlsbad, Austria – Mark of a porcelain stein firm. 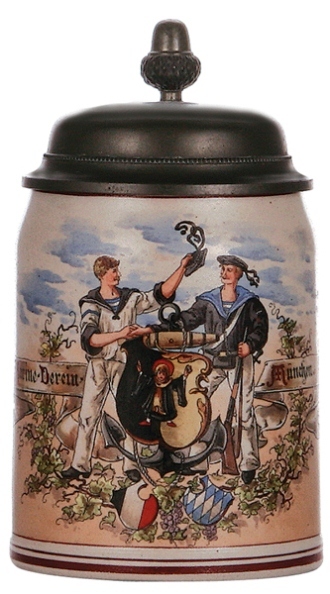 They made mostly 1.2 and 1 liter steins with PUG scenes, have brightly colored borders and some with gold painted lids. 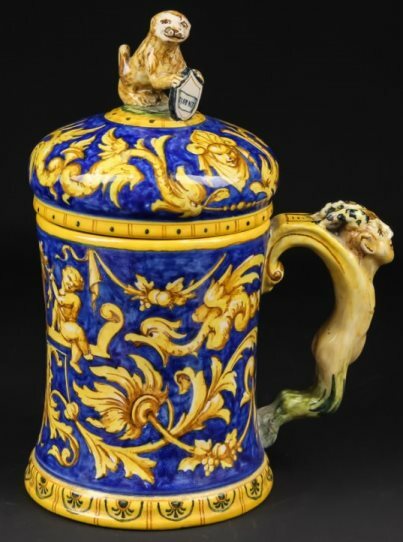 A gold handle on a blue body is shown there. 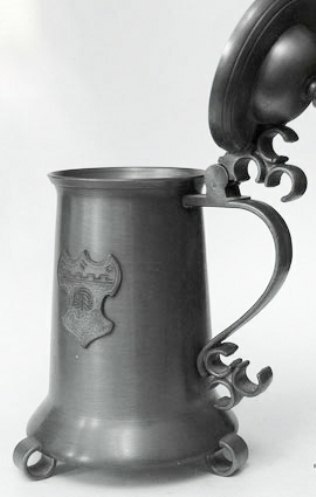 Victorian pewter “trophy” tankards – English pewter and Britannia metal tankards and mugs awarded for rowing, ground sports such as cricket, shooting, and other endeavors at England’s colleges. 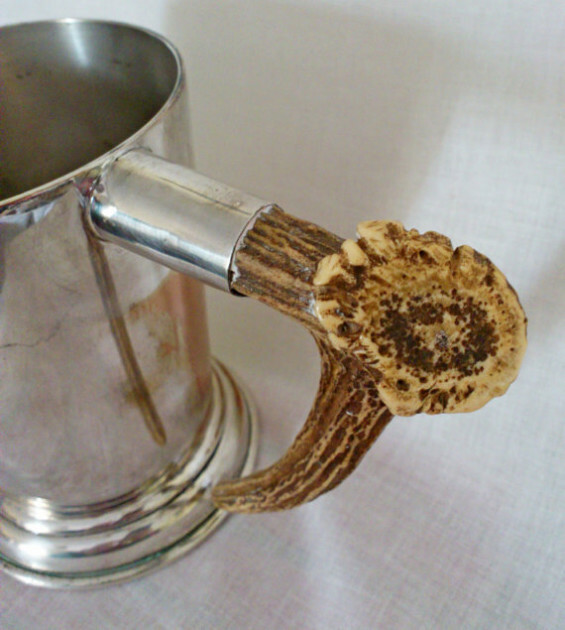 These were all produced in the George II silver tankard style having the double “C” handle, in quart and pint sizes. Most all are found with glass bottoms. 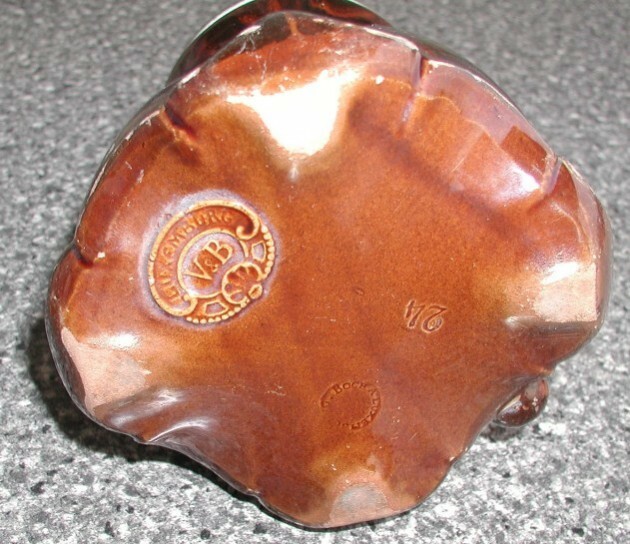 Many were manufactured in Britannia ware by Dixon and Son, and others. “Bright cut” engraved and popular from 1860’s through the 1880’s. Viel Gluck – German for Good luck (or God speed). 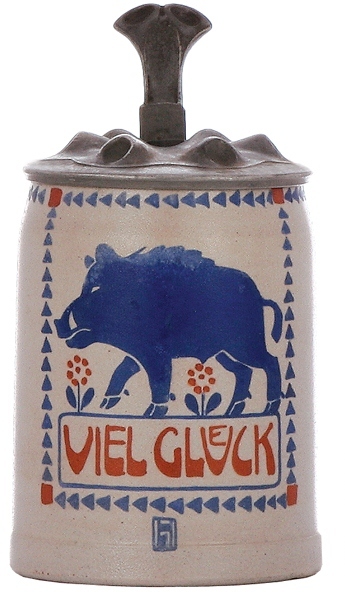 Shown ▲: A .5 liter stoneware stein by Merkelback and Wick, design by L. Hohlwein. 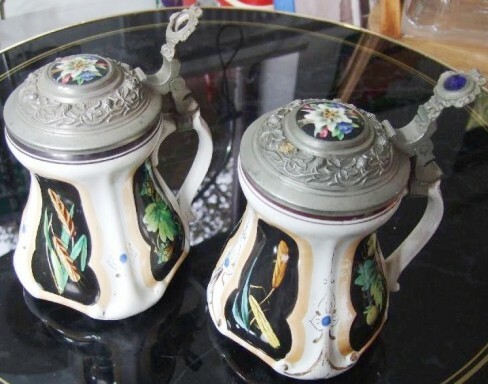 Viennese enameled steins– Usually handsomely done enameled painting on a copper base. Many makers for a long time. Now very expensive when found well done and with no chips, hairlines or cracks. Sokkvabekk called is the fourth, which cool waters ripple round about; “there Odin and Saga all their days drink, glad from golden cups”. That is all that is said about her in the Norse mythological sources. As Hollander points out she is probably identical with Frigg since she is said to drink with Odin (Frigg’s husband) “all their days” and Fensalir, Frigg’s hall, means “Ocean Halls” which is comparable to Sokkvabekk,”Suken Hall”. Old Norse Óðinn – Leader of the Aesir. Odin had a myriad of names including Allfather, Ygg, Bolverk [evil doer], and Grimnir. He also had many functions including being a god of war, poetry, wisdom, and death. His halls were called Gladsheim Valaskjalf and Valhalla. [WALHALL] Odin’s high seat, Hlidskialf, was in Valaskjalf. It was from this throne that he could see over all the world. Valhalla is where he gathered his portion of the slain warriors, Einheriar (Einherjar), whom the valkyries had chosen. The valkyries would serve mead which forever flowed from the udder of Odin’s goat, Heidrun. They also served the warriors meat that came from the boar Saehrimnir, which the cook Andhrimnir would prepare for eating by boiling it in the cauldron Eldhrimnir. The boar magically came back to life before the next meal. After eating, the warriors would go outside the hall and fight each other to the death. They were, of course, brought back to life before the next feast. All of this fighting was practice for when Odin would lead the Einheriar in the final battle, Ragnarok. Odin had a spear named Grungir which never missed its mark and a bow which unleashed ten arrows with every pull. He also owned a magic ring called Draupnir which created nine of itself every night. It was this ring that Odin laid on his son Balder’s funeral pyre and which Balder returned to Odin from the underworld. Another one of Odin’s prized possesions was his wonderful steed named Sleipnir which had eight legs. The horse was the offspring of Loki, who in mare form seduced a giant’s horse named Svadilfari. Sleipnir could travel to the underworld and through the air. Odin also had two wolves, [One shown next to Odin] Geri and Freki, and two ravens, Hugin [thought] and Munin [memory]. He sent his ravens out every day to gather knowledge for him. Odin sacrificed himself for knowledge by hanging on the world tree, Yggdrasil, which means Ygg’s horse. Ygg is a name for Odin and horse is a metaphor for the gallows. He thereby learns the runes. Another sacrifice he made for wisdom was his eye. He gave it up in order to drink from the Well of Mimir which bestowed great knowledge. Because of this, he is typically depicted as having one eye. He is also depicted as wearing a cloak, being old, having a long grey beard, and wearing a wide brimmed hat down low over his face to conceal his one-eyed visage. VALKYRIES – Maidens who chose which warriors on a battlefield would be slain. They also served the brave ones “mead” in Valhalla after their death. 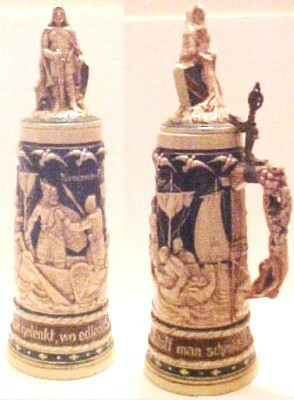 This is the reason for the “bee” in relief on the front of this stein, as mead is made from fermented honey. The son of Odin, and a member of the Aesir, he was the god of thunder and the main enemy of the giants. He would smash their heads with his mighty hammer Mjollnir. To wield this awesome weapon he needed iron gloves and a belt of strength. Mjollnir would return to Thor’s hand after being thrown and was symbolic of lightning. Thor would ride around middle-earth in his wagon drawn by two goats, His abode was Thruthheim [Land of Strength] and his hall, Bilskinir. His wife was Sif. Thursday is named for him and he was associated by the Romans with Jupiter, therefore also parallel to Zeus. They were the wielders of lightning bolts. He is the God of war. He was the only god brave enough to put his hand in the Fenris- wolf’s mouth so the gods could bind it. The wolf bit off his right hand. There is much debate about his left-handedness. In the Norse culture the right hand was given for a pledge, which could be why the right hand was placed in the wolf’s mouth. It has also been noted, however, that the offering of the right hand is to show that it is free of weapons. A left handed person was sometimes considered evil because he could use a weapon with his left hand even though he shook with his right hand. Tuesday is named for Tyr who was known as Tiw, or Tiu, by the Anglo-Saxons. He must have been an important god in the pantheon prior to the mythology we were handed down in the eddas to have one of the days of the week named after him. Since Tuesday is the English name given in place of the name of the day of the week sacred to Mars for the Romans, we know that the old Englishmen thought of Tyr as being similar to Mars. The meaning of his name is associated with water. He was also called Hler and Gymir [the Blinder] (the name of Gerd’s father — it is not known if they are one and the same). Aegir was the god of the seashore or ocean, and called the ruler of the sea by Snorri. He was a personification of the ocean, be it good or evil. He caused storms with his anger and the skalds said a ship went into “Aegir’s wide jaws” when it wrecked. Sailors feared Aegir, and thought he would sometimes surface to destroy ships. According to Sidonius, early Saxons made human sacrifices to a god of the sea, possibly connected with Aegir. Aegir brewed ale for the gods after Thor brought him a big enough kettle. Every winter the gods would drink beer / ale at Aegir’s home. He was, therefore, famed for his hospitality. Instead of having a fire, gold was put onto the floor of the hall to provide light. Gold is therefore called Aegir’s fire. The cups in Aegir’s hall were always full, magically refilling themselves. Aegir had two servants in his hall, Fimafeng [Handy] and Eldir [Fire-Kindler]. According to Lee Hollander, Aegir’s function as the gods’ ale brewer was suggested by the ocean’s foam. 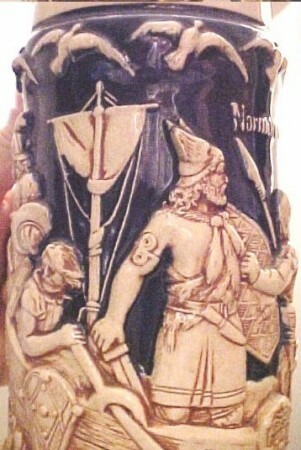 A Viking “coast raiders” scene on this .5 liter pottery relief stein. 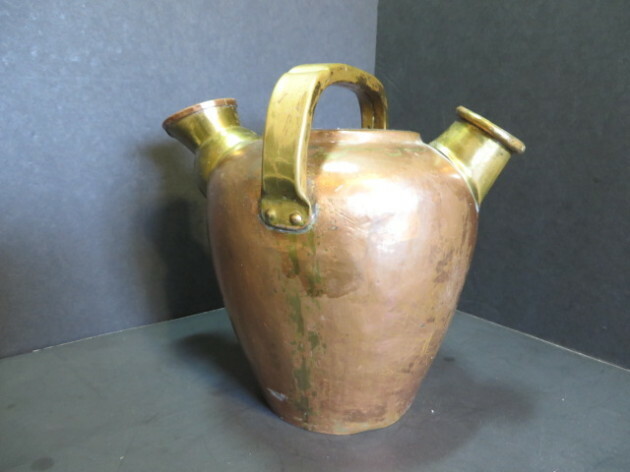 ▲ ▲ Another .5 liter pottery relief stein. This one show the names of the Gods just under their image. The Norse God – “Loki” – This scene is on a .5 liter stein. While this figure is certainly ‘wild’, it is not the German “Wildman” and in fact for a long time several of us local collectors had no idea who or what he represented. Some said he is being sacrificed. If so, why all the stoneware jars in front of him? Late Spring of 2013: I have a lidless one of the in “FWTD” and finally got it out and studied it for a few minutes and soon figured out this was a depiction of the Norse god Noki = their God of fire! The key point which not shown on this photo are the side scenes with several of the Norse or Teutons warriors kneeling down to him.This along with the Priestess (just visible above to the right side) with her arms outstretched towards him, and him not having a halo (a Christian attribute) but a star behind his head finalized it in my mind. The pots are a clue as they need “firing” to become hard. I will attempt to take photos to show the sides scenes sometime. These scenes could be very confusing to some new collectors, that are not “into” the old Germanic stories. 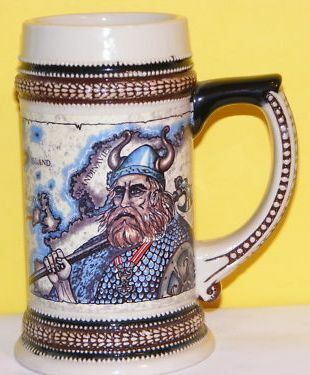 This is not a Viking stein per se, more of a ancient North German Norseman. This ▲is a scene of Lohengrin’s arrival. Lohengrin besides being a story / fable, is a well known romantic opera in three acts composed and written by Richard Wagner, first performed in 1850. The story of the eponymous character is taken from medieval German romance, notably the Parzival of Wolfram von Eschenbach and its sequel, Lohengrin, written by a different author, itself inspired by the epic of Garin le Loherain. It is part of the Knight of the Swan tradition. 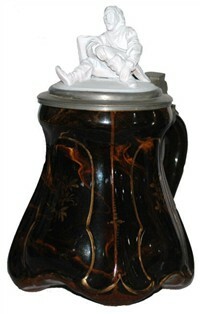 .5 liter Marzi and Remy (a new re-production) pottery PUG un-lidded stein. 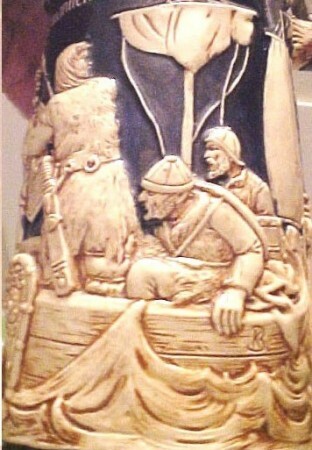 Entitled: “SCANDINAVIA” (to the left of his helm.) Black handled (some collectors care! Me = Nope! 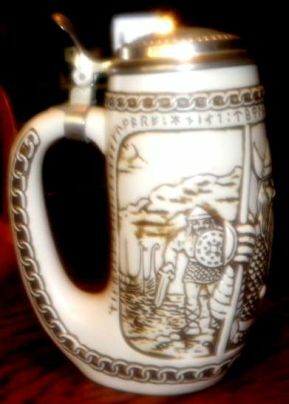 When most people referred to as “Vikings” on drinking vessels, they usually are not! 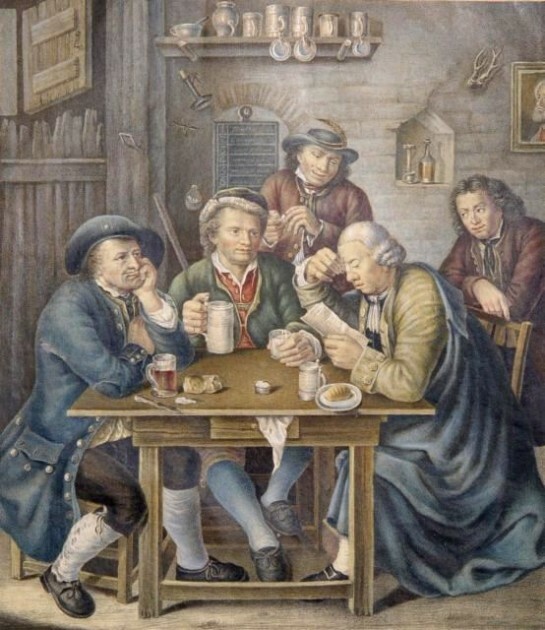 They are usually “Old Germans” (‘Ault Germanen’ or ‘Ault Deutcher’) shown in a festive mood and drinking mead or beer from drinking horns. 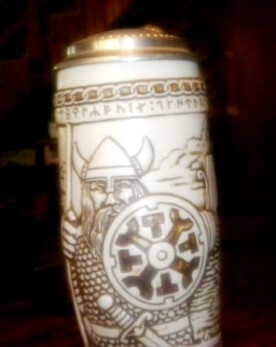 As shown above, if a beer stein has a true Viking scene on it, it might have the Scandinavian word “Wahalla” on it. (Valhalla in English). Any bee (the insect) seen on the stein’s body would indicate a relationship to mead [a fermented honey drink] and not beer. Or any showing the Vikings Gods. Shown ▼: A .5 liter heavy pottery relief, with unusual cut away base. Dumler and Bredin was the maker. “Old Germans” (‘Ault Germanen’ or ‘Ault Deutcher’) also called Nordic Germans, but these again are not Vikings. 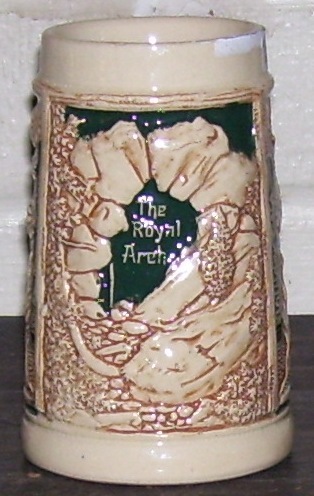 A much newer small ceramic drinking horn showing the much shown but false conception of a Viking helmet with horns. Circa 1970- 90. Villeroy and Boch – (V & B) Luxembourg; (The “Grand Duchy of Luxembourg”) Another of the Villeroy and Boch plant locations. Pictured above ▲ are a couple of variants, and ▼the typical mark for No 24. 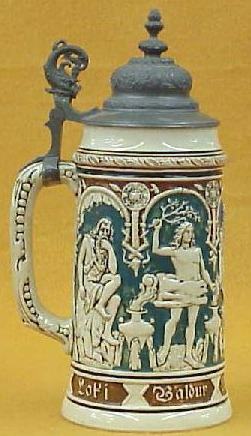 I believe this could be the one and only 1/2 liter stein (style / mold number) made at Luxembourg. If someone knows of more different styles, please email me. 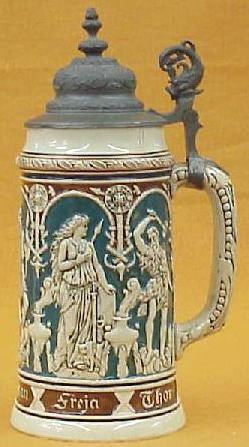 Also see Dorfner and Co. (“D&C”) in this compendium for very similar steins. The same style but made of porcelain, but not by V &B ~AT LEAST THERE HAS BEEN NO PROOF OFFERED TO SAY THEY WERE! Some of these porcelain ones come with bisque porcelain full figurals mounted in the lid or as above ▲ with pewter and porcelain inserts. The bodies are turned sideways from the way the No. 24 is found and they are a tiny bit smaller. As I said: I and others believe to be made by another firm. ► Update 10-15, See Dorfner and Co. (“D&C”) in this compendium. Villeroy and Boch – Mettlach- Mettlach is a small town in Germany’s Saarland. It is the home of one of the Villeroy & Boch (V&B) factories, where stein production began circa 1840. V & B used coal-burning kilns which produced a more uniform product than the wood-fired process. 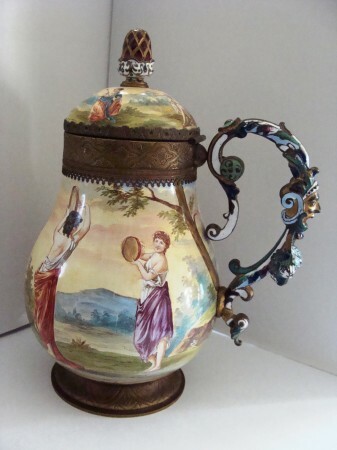 Other factories were located in Dresden, Wallingfangen, Stephfontaines and other locations- Mettlach also produced hand-painted, mosaic, tapestry, print-under-glaze (PUG) and relief items, sometimes incorporating more than one technique. V & B used an extensive marking system which included the incised old abbey tower (called a “castle”) trademark, the year of production, form number, size number, etc. 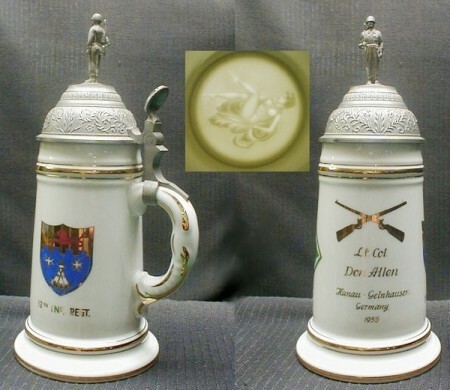 While some old time collectors and dealers consider Mettlach steins the “Cadillac” of stein production, but many beer stein lore educated collectors would rather collect the MG’s, Jaguars or Rolls-Royces of the beer stein world! 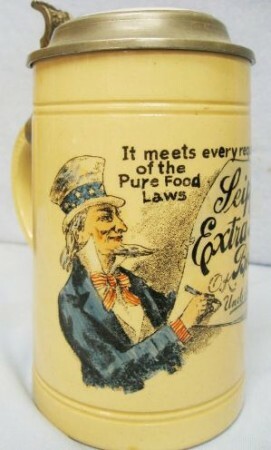 Used as in; “A Vintage old German pottery stein” THE USE OF IT HERE AS AN ADJECTIVE IS WORTHLESS! 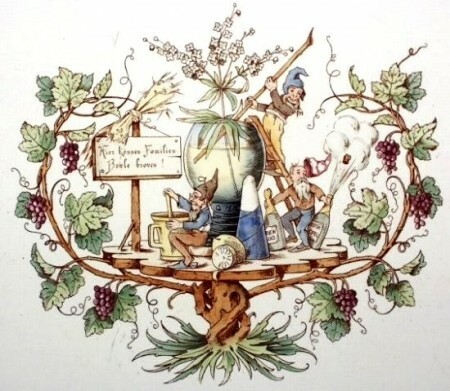 “Vintage” must have a date / year or era indicator with it to have any meaning The word comes from the original usage with group of wines from the same year. and unique got only 120. Shown below ▼ is an actual photo of a silver plated beer mug recently advertised for sale on one of the major “Buy it now ” sales sites on the WWW. Below is the ad. [A] It also would have been more correct to say Silver-plated brass , then to start off with “Brass”. 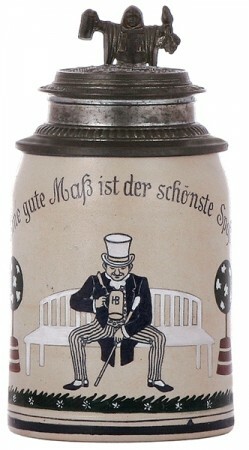 “VIVAT SEQUENS – Means: “Long live the one who comes after [me].” Found on some steins celebrating a birth, especially older ones. 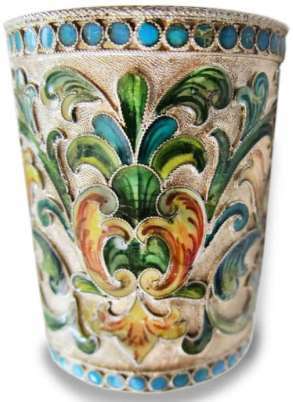 Vodka cup – Shown: Russian silver, 2.25 inch tall, enameled vodka cup. Dated May 1942 = which is an interesting war time date. Vodka jug – Self explanatory. 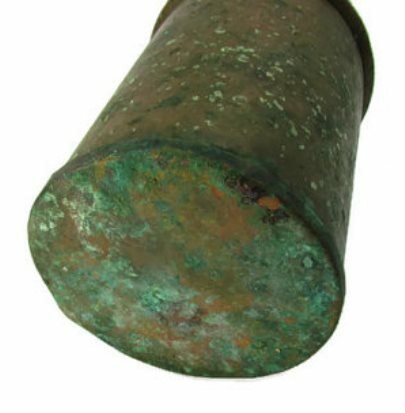 Used in taverns, with a cork in the spot. 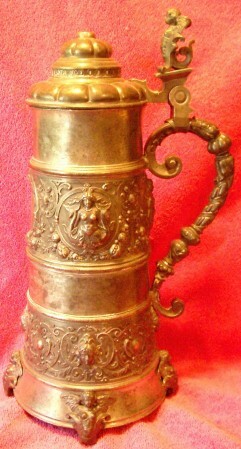 Shown: Russian, copper with two handles (a very Russian trait), 7.5 inches tall. Circa: Late 1800’s. Another example, possibly used for vodka , or some types of wine. Russian pre -revolution mark. Vogel , Otto- Maker of new pewter steins and servers. It has rolled circled feet which are seldom, if ever, seen on older pewter steins. Not listed at “Stein Marks” web site. 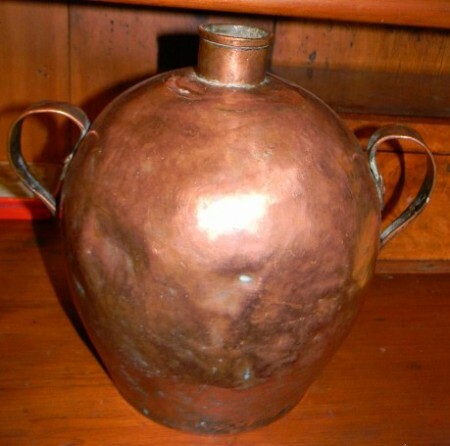 Another larger copper vodka jug with many more indicative of its past life! Volapuk – Above ▲: A H-R stein [unknown mold no.] made to celebrate “Volapuk,” (the ‘universal’ language mostly based on English). Heavily promoted in Germany, where it’s inventor came from. The idea never really caught on. Von Moltke, Helmuth – A famous German General, Chief of the General Staff, who lead Germany against the French in the Franco-Prussian War of 1870-71. 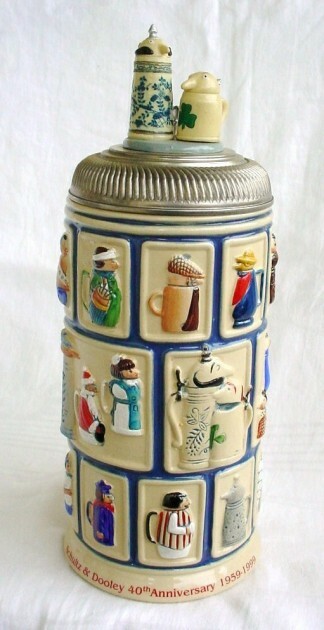 Shown: A 1/2 liter Stoneware Character stein. Circa 1885.